Let me first start off by saying thank you to everyone who has shown interest in my Boutique TuTu Tutorial! I’m amazed at how many times it’s been pinned! I have had a ton of emails about the satin ribbon on the bottom of my tutu that is featured at the bottom of the first tutorial! So I have decided to do a follow up and show you how I how I did it! 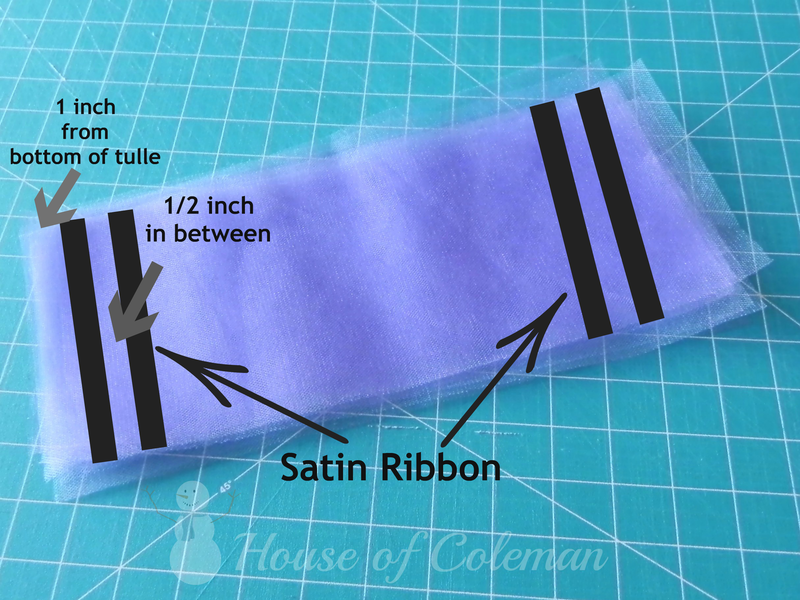 You will need to do this step after you have cut all of your tulle for your tutu and BEFORE you put your tulle on the waistband. I have listed measurements to help you cut the tulle to the proper size in the first tutorial! First I cut the satin ribbon length to the width of my tulle and sealed the ends with a lighter. You will have a bunch of frayed ends if you do not seal the ends of your ribbon. Once I had all my ribbon pinned in place I stitched, with a sewing machine, my ribbon into place. I just went right down the middle of the ribbon. After all of my ribbon was sewn on to the tulle I then attached the tulle to the waistband. I have had a lot of questions about if this would work with a longer tutu, I believe so. I think the possibilities are endless really! You could use 1 1/2 inch satin ribbon instead of 2, 1/2 inch pieces as I did. You could do multiple colors for a multiple color tutu. Get creative! I love seeing pictures of the tutu’s you ladies have made with my tutorial! Keep em’ coming! Great blog and great tutorial! Thank you! Ok, so I’m in the middle of pinning and sewing my ribbon to my tulle. Do I do ribbon on both sides of the tulle? It seems to weigh the tulle down…suggestions? When you wrap the ribbion round the top of tutu and make the bow how much ribbion should I use? What length tulle do you use? 6 inch or something wider? I am in love with this style of tutu and must make one immediately 🙂 Thanks!! Will if just automatically have that rounded look on the ends when I sew the ribbon in place? 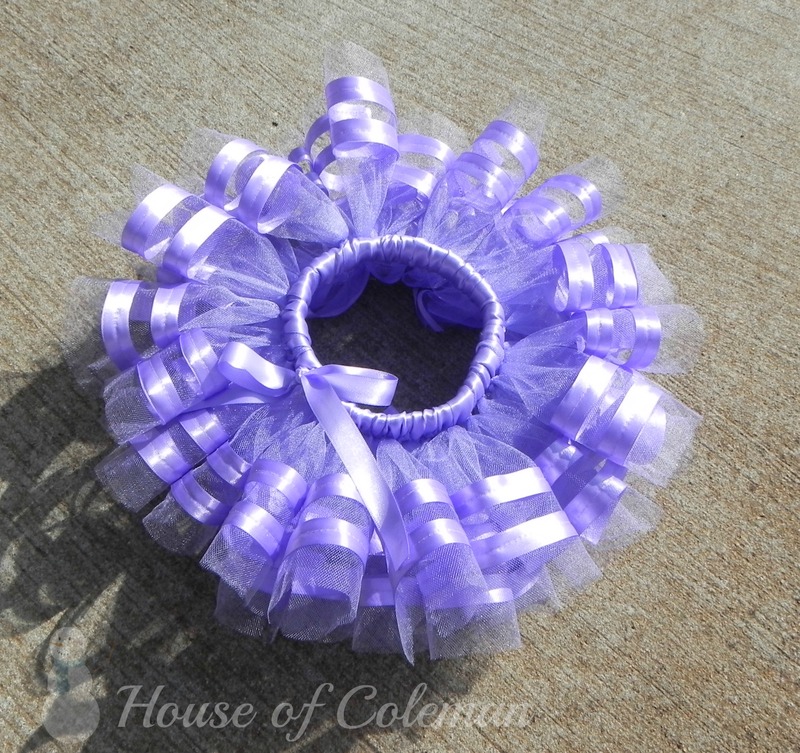 Hi….can I use the hot glue gun instead of sewing the satin ribbon? Question – what if you don’t know how to sew? I have a machine but have no clue how to use it yet and and need like 15 Tutus made in less than a week. I have all the supplies I think – have never made a tutu in my life – I am very creative, I make boutique hair-bows,Candy Bouquets, etc – and am just now getting into tutu’s. I volunteered my time to the place where I have my booth at and is a new place of business. They are offering Tea Parties for little girls as well as other birthday parties. They are on a strict budget and is why I said I would do it. Any help would be appreciated – would love the sewn look here but I don’t think I can learn my machine in the time it takes to make what I need and get them to the party in time so, do you have a no-sew option? I also read through the 1st tutorial and did not find where you mentioned how long the strips of tulle should be as well as the width of the cuts. Thank you for the help and love you ladies out there that help us learn things like this :). How do you put the tulle on the elastic. Sorry I don’t know much about blogging but I like your stuff. Is there a way to follow your blog and be notified when you add new stuff? Thanks!! Im very new to the world of sewing and would love to give this a try.. but I am confused as to how you made the tulle with ribbon all end up in little loops/circles on the tutu? Did this just naturally happen bec the ribbon or is there another step to make it all round and cute like that at the end? THANKS for these btw! Whenever I see pictures of tutus with satin ribbon the pieces all seem to curl. Does it do that on their own or did you somehow curl each piece? do you put ribbion on each piece of tulle before you apply it to tge waistband? Love your tutu! I was wondering if it is made by tying the stripes if tulle to an elastic waistband ? I have always wanted to make one but I can’t figure out how you made such a pretty satin waistband. I love this look. Hopefully this year I can do this beautiful tutu for my daughter’s birthday. One question – what size satin ribbon did you use in the pictures?